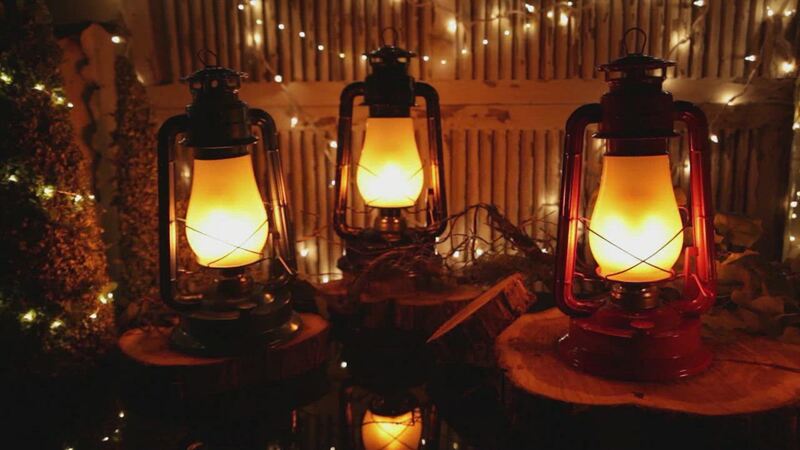 This unique copper-colored digital flame LED lantern mimics the authentic dancing light found in traditional lanterns and oil lamps, but entirely with LED technology! A warm LED bulb flickers on and off in flamelike patterns so realistic you won't believe your eyes. Metal construction and a frosted glass chimney complete the authentic look of this lantern. Use them anywhere you'd use ordinary lanterns, including indoor settings -- no smoke, no mess, no refilling, no problem. You'll be amazed at how realistic these lanterns perform! We enjoy this lantern! The flame is quite realistic. The lamp is made of tin, but it looks good. It is lightweight and safe to hang. The cord has a switch to turn the lantern on and off, but we have it plugged into a timer so we don't have to worry about turning it on/off. Its fun to just sit and watch it! THESE ARE GREAT, I WILL USE THEM INSTEAD CANDLES . Everything I was looking for. Love it! You pull it out of the box, plug it in and enjoy. These lanterns are absolutely marvelous. We put them on our Tiki Bar outside with another on our 5 O'clock Somewhere table. They give off a good deal of light without losing the ambiance they create. The lantern is great and looks like it has a real fire burning. It is a great decoration item for any time of the year. The lantern itself looks very good. The flame is good, but the flames are coming and going far faster than a real flame, so it does not look realistic. If there was a way to slow down the action, it would be a fantastic product.